So what is this not-so-secret workplace secret? Researchers at the University of Warwick claim that happiness makes people roughly 12% more productive. The secret to a more productive workplace isn’t really much of a secret at all. In fact, it should be pretty obvious. However, many employers struggle to motivate their employees and enact long-lasting change that positively affects productivity. So what is this not-so-secret workplace secret? Happiness. According to a study by Bright Horizons, employees with high morale are simply more productive and 89% more likely to put in extra effort and work extra hours. To put this seemingly unquantifiable idea – increased productivity – into a numerical value, researchers at the University of Warwick claim that happiness makes people roughly 12% more productive. “The driving force seems to be that happier workers use the time they have more effectively, increasing the pace at which they can work without sacrificing quality,” explains Dr. Daniel Sgroi of the University of Warwick’s the Department of Economics. No, the million dollar question – how do you increase happiness? Self-expression is very important. While you probably can’t let your employees wear whatever they want, you can allow them to express themselves in other ways, such as decorating their office space. Let your employees display pictures of their family members. Let employees hang posters. And let employees be themselves. It’s that simple. Of course, you have to make sure that everything is done as tastefully as possible. One way to better morale is to break down management barriers and make yourself available to your employees. By doing so, you will help build trust and loyalty and, of course, happiness. Your employees will feel closer to the company and feel as if their contributions matter, which brings us to our next point – feedback. It is not enough to simply make yourself available to your employees. You must also provide some sort of value. We are talking about giving feedback – positive and negative. Let your employees know that you see what they are doing and that you will reward hard work. If you want to boost happiness in the office, get your employees out of the office. And if a few minutes is beneficial, think of what an afternoon of fun and excitement can do. A corporate retreat is a great way to reward your employees for all of their hard work while also instilling several valuable lessons. 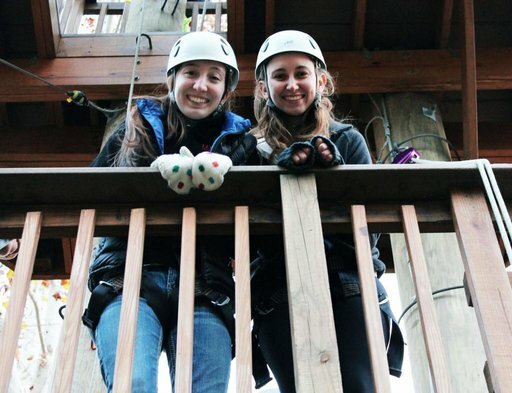 Click Here to Schedule Your Corporate Retreat with Terrapin Adventures! Conveniently located between Baltimore and Washington DC in beautiful Howard County, Maryland, Terrapin Adventures will create a custom program designed to meet your unique needs. If you have any questions, please call Terrapin Adventures at 301.725.1313, or email us at info@terrapinadventures.com to learn more. This entry was posted on Friday, October 30th, 2015 at 6:57 am. Both comments and pings are currently closed.